I don't have to tell you how crazy I am about Linda Simpson Designs and her Emerald City Crafts Challenge, do I? I love being part of her DT, a fabulous group of fun, friendly, and creative ladies! We do one challenge each month which runs for three weeks from the first Friday, then we take a week off to choose the winner and Top 3. The theme is always "Anything Goes" and you can use any kind of image. Of course, we all use images from Linda Simpson Designs because they are sooo gorgeous, and we truly love it when you use them, too! 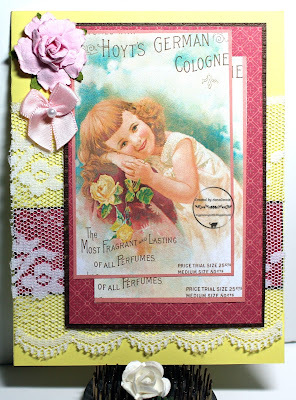 This one with the sweet little Hoyt's Perfume girl is from the "So Cute" set and the papers are from the "Nostalgia" set. I started with a yellow card base, added a matted scrap of the same background dp, and layered on a scrap of white lace. I put the image piece together by using two of the images, offset against each other and then layered onto the matted background paper. That whole thing went on top of the lace. I love what you have done here Connie, the lace and colours are gorgeous. The ephemera really pops against the wonderful layering. Absolutely a vintage piece and so beautiful too. Such a lovely vintage card! Very nice, NC! Thanks for joining us at PIP Challenges! WOW, that wide lace is beautiful. Lovely image and fabulous card.